Researchers recently identified a huge bowl-shaped crater measuring a staggering 19 miles (31 km) across under half a mile of Greenland ice. The immense crater was likely formed by the impact of a mile-wide iron meteorite, which must have unleashed 47,000,000 times the energy of the nuclear bomb dropped on Hiroshima at the very end of WWII. The biggest question on everybody’s mind right now is when it all happened. 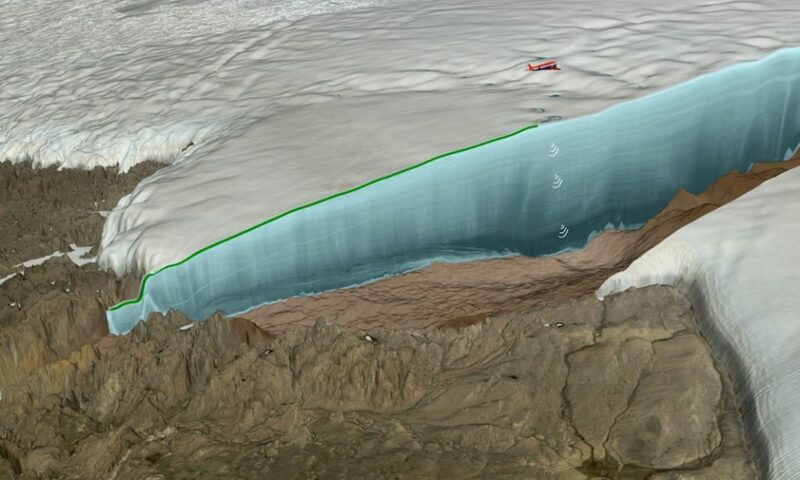 Illustration of the newly-discovered immense crater in Greenland. Credit: Nasa/Cryospheric Sciences Lab/Natural History Museum of Denmark. Kurt Kjær, a Professor at the Natural History Museum of Denmark in Copenhagen, suspected an impact crater might be hidden away under Greenland’s ice after NASA radar images showed a massive depression of the bedrock beneath the Hiawatha glacier, in the northwestern part of the island. In May 2016, one year after the satellite images were released, scientists flew over the glacier pointing a cutting-edge ice-penetrating radar onto the glacier to map the underlying rock. The 3-D images clearly show all the hallmarks of an impact crater — a 19.3-mile-wide circular feature with a rim around it and an elevated central region. The crater’s basin is about 300 meters deep, suggesting it was perhaps made by a one-mile-wide meteorite. This immediately classes the impact site among the top 25 largest known craters on Earth. According to the researchers, the impact would have melted and vaporized approximately ~20 km3 of rock. “There would have been debris projected into the atmosphere that would affect the climate and the potential for melting a lot of ice, so there could have been a sudden freshwater influx into the Nares Strait between Canada and Greenland that would have affected the ocean flow in that whole region,” co-author John Paden, Associate Professor of electrical engineering and computer science at Kansas University, told the AFP. Kurt Kjær collecting sediment samples from the crater’s drainage system. Credit: Natural History Museum Denmark. The meteorite was likely mostly made of iron, judging from geochemical tests performed on particles of shocked quarts collected from a nearby floodplain. “Beyond the grains in the sediment sample that we interpret to be possible ejecta, no ejecta layer associated with this structure has yet been identified. Despite the absence of such additional evidence, an impact origin for the structure beneath Hiawatha Glacier is the simplest interpretation of our observations,” the authors wrote in their new study. Black triangles represent elevated rim picks from the radargrams, and the dark purple circles represent peaks in the central uplift. Credit: Science Advances. When exactly did the impact actually takes place is not at all certain. 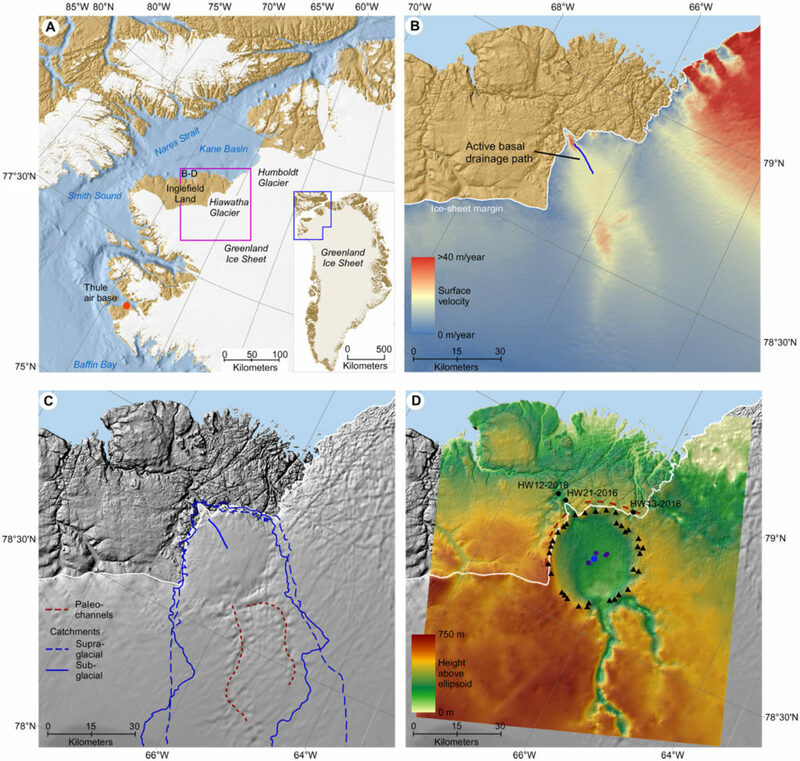 Kjær and colleagues are confident that the crater is no older than 3 million years, the time when ice began to cover Greenland. 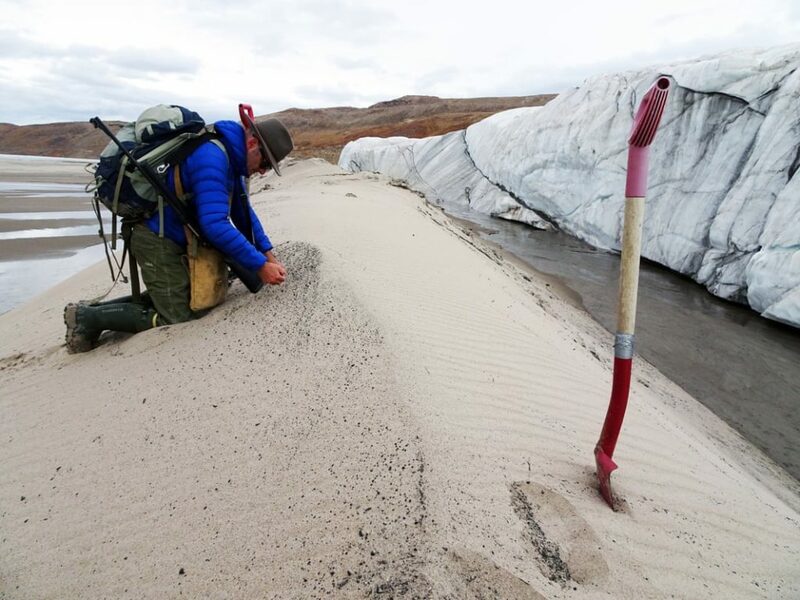 “The age of this impact crater is presently unknown, but from our geological and geophysical evidence, we conclude that it is unlikely to predate the Pleistocene inception of the Greenland Ice Sheet,” the authors wrote in the journal Science Advances. As for the lower limit, radar images show that the deepest layers of the glacier that are older than 12,000 years are very deformed compared to upper layers and are filled with lumps of rock. To be sure, researchers will have to use radiometric dating techniques on material from the crater — that means drilling through half a mile of ice. It might take a few years before this happens, however.